Registration will be closed at 11:00, 1 Feb 2019. Those who are not registered may try to walk in on a first-come, first-served basis. 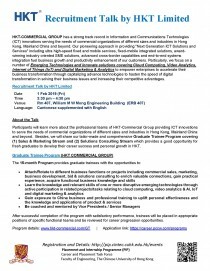 HKT-COMMERCIAL GROUP has a strong track record in Information and Communications Technologies (ICT) innovations serving the needs of commercial organizations of different sizes and industries in Hong Kong, Mainland China and beyond. Our pioneering approach in providing “Next Generation ICT Solutions and Services” including ultra high-speed fixed and mobile services, fixed-mobile integrated solutions, award-winning industry oriented SME solutions, advanced cross-border capabilities and end-to-end systems integration fuel business growth and productivity enhancement of our customers. Particularly, we focus on a number of Emerging Technologies and innovate solutions covering Cloud Computing, Video Analytics, Internet of Things (IoT) and Digital Marketing & Analytics to empower enterprises to accelerate their business transformation through capitalizing advance technologies to hasten the speed of digital transformation in solving their business issues and increasing their competitive advantages. 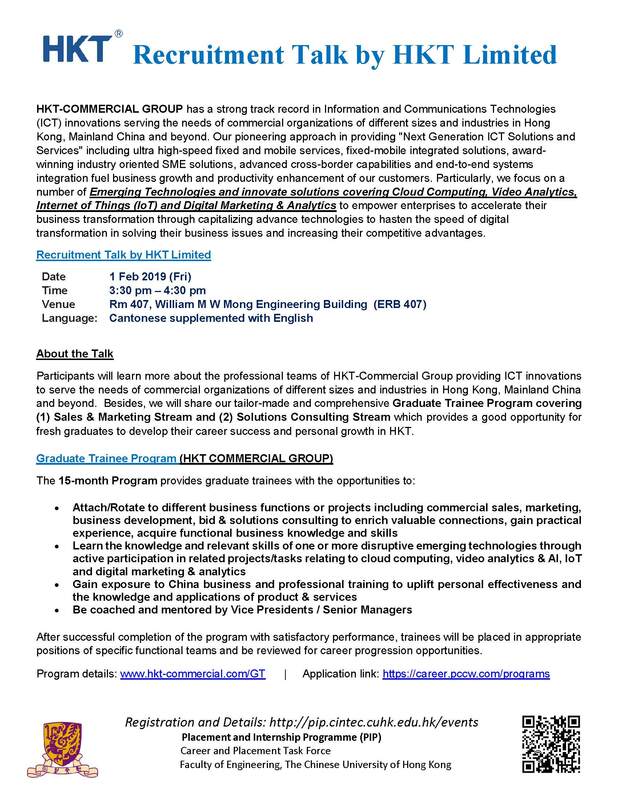 Participants will learn more about the professional teams of HKT-Commercial Group providing ICT innovations to serve the needs of commercial organizations of different sizes and industries in Hong Kong, Mainland China and beyond. Besides, we will share our tailor-made and comprehensive Graduate Trainee Program covering (1) Sales & Marketing Stream and (2) Solutions Consulting Stream which provides a good opportunity for fresh graduates to develop their career success and personal growth in HKT. After successful completion of the program with satisfactory performance, trainees will be placed in appropriate positions of specific functional teams and be reviewed for career progression opportunities.